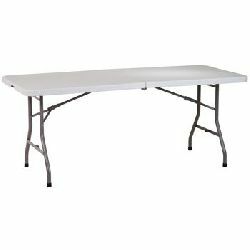 6ft Folding Table. $10 per table, or consider renting 2 tables and 12 chairs for $32. Other packages are available as well. 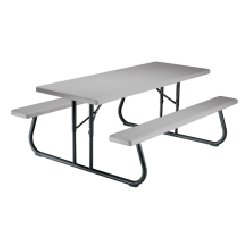 Large Folding Picnic table seats 6-8 comfortably. $15 per table/day. Add an umbrella for an extra $10. Black Outdoor Folding Chairs. $1.50 each or they can be rented in a pckage of 2 tables and 12 chairs for a total of $32.